Free service call with any repair or service. We will perform the repair or service only after you approve the job, based on an estimate that is provided by our technician. You will not be charged extra for our need to travel in order to reach you; you will also not be charged extra for repairs done at night or on the weekend. We are confident that with United Appliance Repair LLC., you are getting the lowest possible price for your appliance, heating or air conditionings repair. 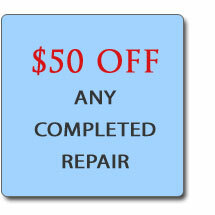 We offer a $50.00 off printable online coupon, which can be used for any appliance, air conditioning or heating repair. All of our work is guaranteed for 90 days. If the same problem appears again within 90days of us fixing the problem, just call us and we will come back and fix it without charge. We are very flexible and accept the following payments: cash, major credit or debit cards, checks or payments over the phone. Call us anytime for appliance, air conditioning and heating repairs. You can have the confidence that we are here to deliver the service you need, and we always stand behind our services.